SouthWest companies are at the forefront of driving a new phase of contactless payment systems for transport. IT specialist Hoeft & Wessel in Swindon is to provide its new Almex e-Ticketing system across the UK for easy contactless payment by credit card without prior registration. The system uses the new generation of NFC (near field communication) chips, some of which are designed by the Cirencester division of chip giant Broadcom, while teh core software comes from a Bristol firm. With the new NFC ticketing system it was possible to minimise the transaction time required for identification of the credit card or the e-Ticket, which now amounts to less than 500 milliseconds. 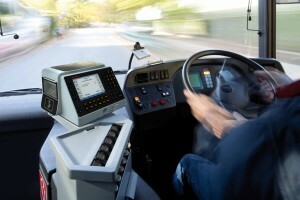 The first practical test is now on the cards: Hoeft & Wessel will be equipping FirstGroup, the largest private bus operator in the United Kingdom, with 4,000 systems. They will be integrated into the corporate IT system, and a further 1,500 are at the planning stage. “Now that we have reached a leading position in the bus market, we plan to intensify our efforts in the field of stationary ticketing terminals. In the process, in future we will also be targeting the railway market in the United Kingdom,” says Peter Aylward, General Manager of Almex UK in Swindon. The software technology to make this happen was developed in Bristol by Creditcall. Its Contactless Kernel enables acceptance of Visa payWave and MasterCard PayPass cards in retail and unattended environments. “CreditCall is a globally acknowledged industry expert with an exceptional track record in the payment sector. Their Contactless Kernel has enabled us to quickly and economically integrate contactless payment functionality across our offering, ” said Peter Aylward, General Manager of Almex UK, part of Hoeft & Wessel. In the past, contactless credit cards provided for payment of a service at a predefined price. In contrast, as passengers’ boarding and exiting statistics are recorded, this means that the total fare is only determined when changing trains or buses or at the end of the journey. Moreover, passengers used to be required to register with the transport authorities and buy a special identification medium to be able to use these processes. The innovation developed by Hoeft & Wessel on the basis of credit card systems now ensures that all passengers need to use the check-in/check-out system is their credit cards. Passengers also benefit from the new ticketing system when paying for tickets and finding the correct fares: it automatically selects the suitable ticket and the best fare. The background system enables individual transactions to be consolidated across a period of time capable of being selected by the operator; only once this has been done is the transaction submitted to the payment service provider. This helps to save transaction fees. If a best-price strategy is applied, in return the passenger can be billed with the most favourable ticket for his usage behaviour, for instance in the form of a day ticket rather than several single tickets.